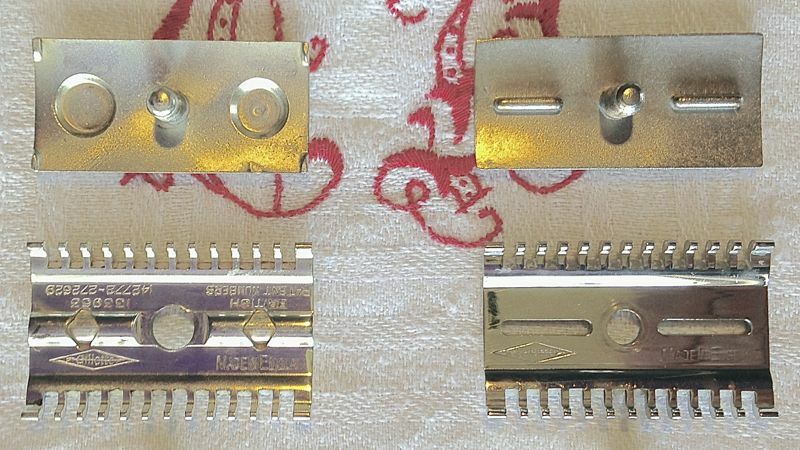 here are side-by-side pics of a uk gillette new and a uk gillette goodwill (which is per definition also a new). the bladegap is slightly larger on the new and it shaves slightly more efficient - but is also slightly less smooth. for both i use an angle where the handle is midway between horisontal and vertical: 45 degrees. 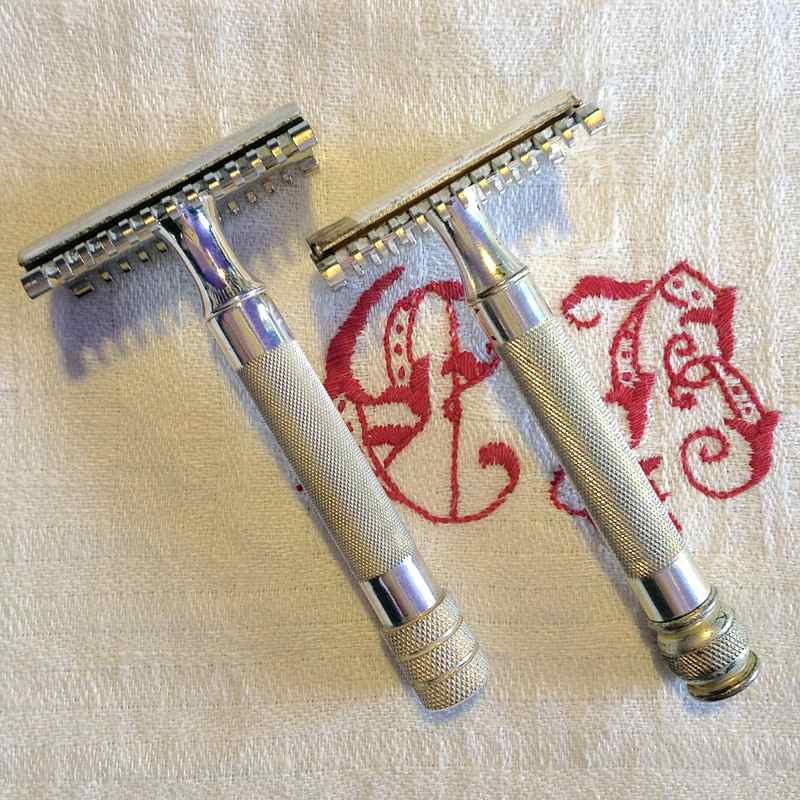 more shallow will make both razors less efficient and less smooth. 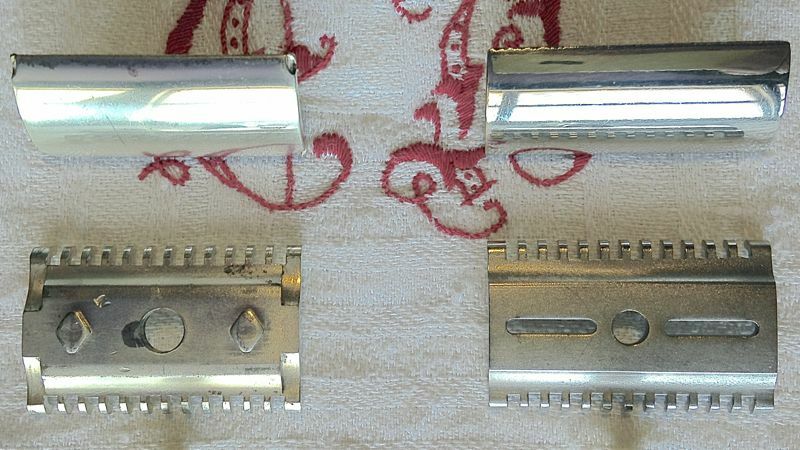 the blade alignment is dead on for both razors. 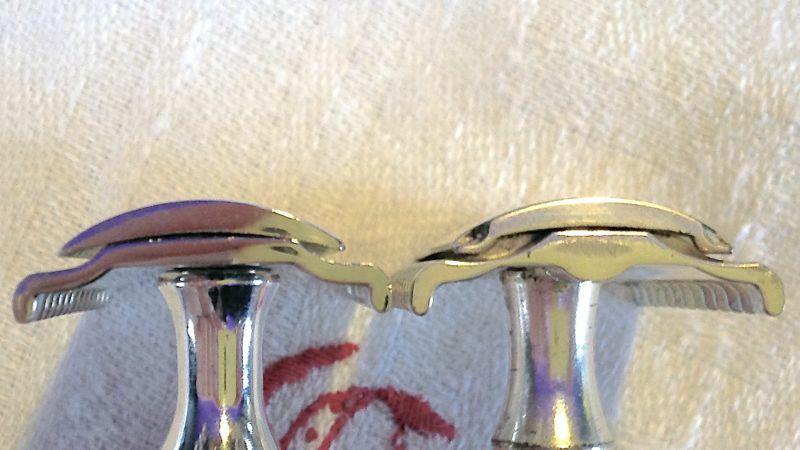 the goodwill is all silver and the new has nickel head and silver handle - this silver handle is more substantial and more comfortable than any handle i ever had. as far as i understand - the goodwill is early 30's and the new is mid to late 30's. it seems that this model of the new is the razor that leads to the development of the tech. all in all i prefer the new. when used with a very light hand i find it the best razor i have. it's my everyday razor. i will add that i have another identical new head - but the construction and shave of the new in this pic is superior. Open combs razors are really growing on me lately. For a long time, I didn't even look twice at them. Now I look three times, four...more! +1 to that. I really like the Gillette OCs but they seem to be pretty aggressive as is. Nice pair of razors OP. Oh I am a risk-taker. I don't find them too aggressive. I use a Fat Boy opened up to 9. The R41 is what I like in a shave at times. (04-07-2014, 02:05 AM)Shaun Wrote: Oh I am a risk-taker. I don't find them too aggressive. I use a Fat Boy opened up to 9. The R41 is what I like in a shave at times. Each to their own I suppose. I normally shave with a straight but occasionally use a Fat Boy, OC Gillettes and a R41. Haven't used the Fat Boy in a long while but the OCs and R41 can give a straight a run for the money in closeness and pretty close in longevity of the shave. That is good enough for me. Let us know how the shimming works out. 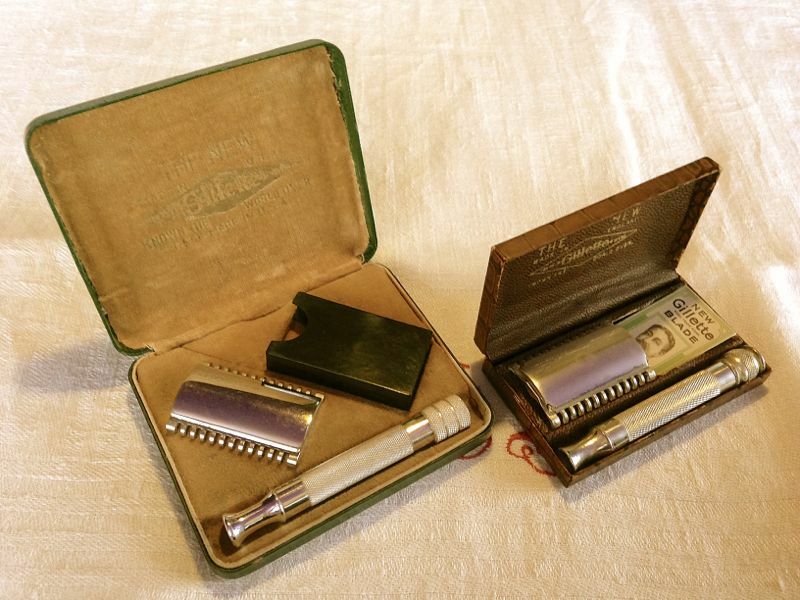 The English New is my favorite vintage razor as well. My favorite is the flat bottom twin pin like yours with a Weber Bulldog SS handle.